Watch the video for a virtual tour of our programs. An online crash course for new investors to go from non- investor to investor in 3 Days! The investing edge is a private 6- week group program designed to help investors (beginners specifically) learn the ins and outs of investing without the stress of doing it alone, or without a plan. 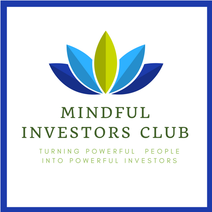 The Mindful Investors Club LIGHT (MIC) is a light version of the original MIC. MIC light offers unlimited access to monthly investor trainings and masterclasses. Get immediate access to 5 Investor Trainings and 1 more each month! Members also get access to a private Q&A sessions with Angela. REGISTRATION OPENS MONTHLY. Angela offers 1-1 private brainstorming sessions as well as custom portfolio creation in a 'Done- For- You' style.